I had worked up to three at a time but I found that I was not really enjoying painting this way. I felt like a factory. So, I finished those and now am doing just two at a time again. I work very slowly so this is ok with me. I think everyone has their magic number. I love it that you take your time. I tried doing 2 kits at once. I couldn’t remember what I did to this limb or that limb. So I only work on one. When I’m close to finishing that one, I will wash n get the next one ready to go. I have 5 totes of kits. I keep saying I’m not gonna buy anymore kits. I guess I be lying to myself. 5 works great for you. Each one is always beautiful. keep saying I’m not gonna buy anymore kits. I guess I be lying to myself. I think almost everyone here does that. I guess it may sound crazy…but I do them in alphabetical order. LOL I inventory my kits as I buy them and list them by names I give them. Occasionally I end up going a little out of order, but mostly I stick to that plan. IDK why…maybe the librarian side of me. Worked over 15 years in libraries. Could be. Could be OCD. My DIL and I used to shop together. When we got our change back from a purchase both of us had to put all the bills in order by the alphabet that is on each one. I noticed one day that we both did that! I said, “You know – this is an illness!” LOLOL I also have an alphabetic list of my dolls. 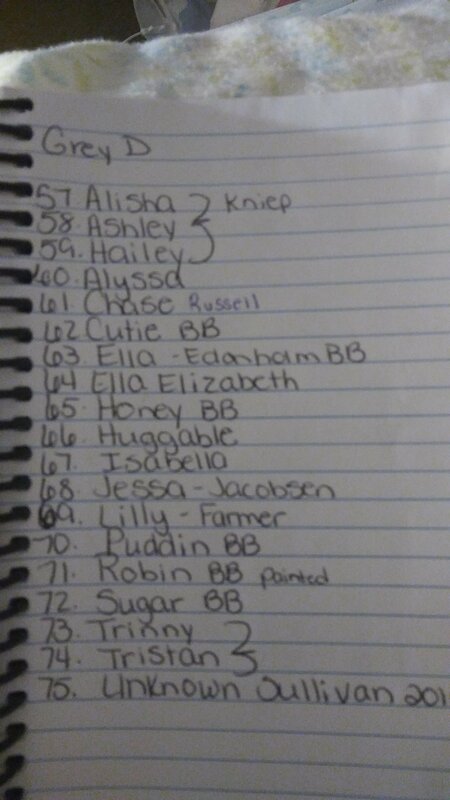 Not to make them in any certain order, but to be able to look at my list when I see a doll I want to be sure I don’t have it already. I think everyone has their own way that works for them. Not me, either! I don’t think I am OCD nor did I think you might be. I was just thinking about my daughter in law and I, really. But, nope – I am not a fanatic about my housework at all. Good thing, too, since I am no longer able to do it. I have my kits listed in alphabetical order by tub but not one master list so I have found that I have accidentally purchased more that one of a kit multiple times. Now I look through the whole list before I buy anything. That is precisely what I was trying to avoid with the master list. Plus, it is easier since I put them all in the same closet. I have to clean out some more Christmas stuff, though, so I have room for all the reborn supplies. That is the project I speak about rearranging that room and getting it all set up to paint. This is one of my 13 pages. Once I move nack home, I will probably just work through one tub at a time and then refill it with the ones laying willy nilly about the house. Lololol. Okay. You win! Your problem’s worse than mine. I don’t care, either. AWow, I feel awful! I’ve been doing this for over ten years off and on mostly for myself or friends. My stash sounds pathetic compared to some of you with usually under ten to pick from. Due to me not working on them much the last few years, they have piled up a little bit. I usually pick the one I like least just to get rid of it unless someone wants a specific one. I have to finish about four right now. Couldn’t find my box of bodies today. Need organization! And to convince hubby I need at least fifty more kits! Of course you do! Gotta keep up with the Joneses, you know. lol I’ve started storing my kits with the body in the bag with the kit. So much easier than trying to find the right one when it’s time to put the baby together. I have a friend who alphabetizes all of her spices, it cracks me up but she always knows where stuff is! I keep all my babies in rubbermaid tubs, I have bodies, rings, plugs, COA’s all together, if I am missing a piece I put a little post it on it so I remember to order it next time I place an order. I label the outside with a card that says who it is, what I paid, and what kind of baby it is. I use to have an inventory on my computer that my husband set up for me but I chucked it, too complicated, I just look at the shelf and I can see what I have. The ones in front are finished babies. This is a neat way to do it, also. 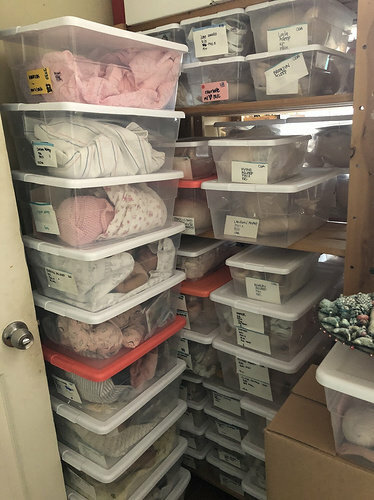 I also put bodies in my boxes with the kit they go to, and for the same reason – I don’t want to have to go through everything every time I want to do a doll and check if I have everything. Kind of a pet peeve of mine – I don’t want to start anything unless I have all I need to complete it. As in sewing, I want all the thread, zippers, buttons, lace, etc., etc. before I begin. Otherwise, I get to a certain point and want to keep going and have to stop. That irks me. Same here. I hate to get excited and be missing one plug! grrrrrr… it also saves on shipping just to order everything at one time.